The Supreme Court ruling on Section 377 has become the talk of the nation. Newspapers and television channels are filled with LGBT activists, legal experts and representatives of political parties discussing and debating (often very heated debates) on this contentious subject. 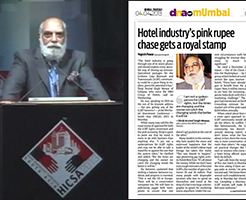 In this blog, I wanted to share the thoughts we had expressed during the HICSA Summit in Mumbai in April 2013. It was Mr Manav Thadani of HVS who had initiated the exercise of getting me to speak on LGBT Tourism and whether the hospitality industry was ready for it. With the December 2013 ruling, there will now need to be re-think on this burning subject-of-the-day. As we go through the thoughts and ideas expressed during the HICSA Summit, we realize that there will be now more challenges in India. LGBT Tourism will go through a phase of turmoil. We hope that in the months to come these conflicting situations would be resolved.